My original plan was to make a round fox’s face with white circle cheeks, a bit like on this (frankly rather goregous) dress from Wild Things Dresses. Is it ok to take inspiration from clothes? I think so! As you can see it kind of worked but this is a craft that my 22 month old did rather than by a grown up! I gave my son the option painting his fox or glueing on tissue paper so this was his choice. At first he chose to cut the tissue paper, making it a good craft for helping with scissor skills and when he got bored with that he chose to tear it instead, which is good for promoting fine motor skills. The trick to getting things glued where you want them rather than them being all over the shop is to mark in pencil where the white bits would be and then only spread glue where you want the brown fox colour. Of course kids being kids they will glue things wherever they please anyway, which is absolutely fine, but if you do want little white cheeks that’s my trick! I cut out the ears from the second paper plate and the nose from some black card and we glued these as well as the eyes on together, with these bits my daughter obviously had a bit more help from me. 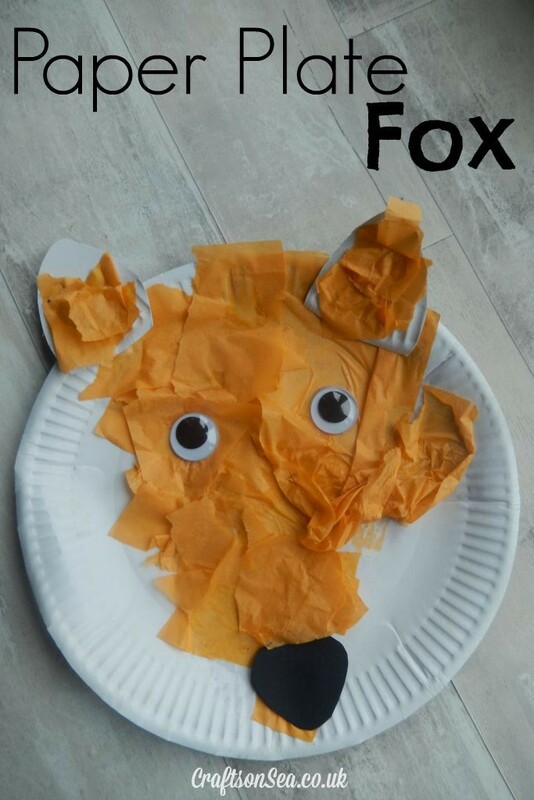 My son’s paper plate fox was super cute too but as I was juggling doing a craft with two small people and keeping all things scissor related safe I didn’t manage to get the camera out at all. Ten minutes later when I went to photograph them the scissor skills had been massively embraced (good!) but his poor old fox had big chunks missing out of his head. Oops! All this summer I’ve been joining in with some blogging friends to bring you some simple craft ideas using materials you might already have at home. Do go and check out what they got up to with paper plates! Jen at Mum In The Madhouse did this cool paper plate weaving. Anthea at Zing Zing Tree made this super cute paper plate rainbow garden. Anna at In The Playroom made this great paper plate plane in the clouds. This is fab, I work in a school and one of the topics we are doing is animals and this would be a great activity for the kids to do, Thanks for sharing.